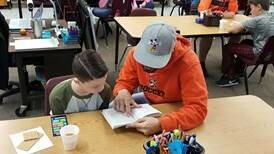 As part of the “Snuggle Up and Read” festivities on Thursday, more than 50 Cowley College students and coaches took time out to read books to children at Jefferson Elementary School in Arkansas City. 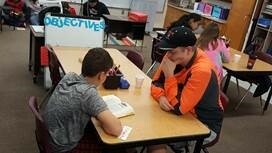 Mike Rosales, TRiO advisor and transfer specialist, visited with teachers and staff at Jefferson Elementary who expressed their appreciation of the Cowley students volunteering to read. Along with Cowley College student ambassadors and representatives from the IMPACT program, members of the men’s soccer team, track and field team, and volleyball and softball teams volunteered their time.